Heat flux has been found to be the best non-intrusive indicator of the performance of ovens. What is Oven Heat Flux? Heat transfer follows three mechanisms during baking: radiation, convection and conduction; heat flux involves all three of these components. Every product has its own unique mix of heat flux components; therefore each has its own heat flux profile. Critical to understanding finished product characteristics is knowing the total heat experienced by the product, and the component quantities of radiant and convective heat fluxes. The difference in these components explains why one oven bakes differently than another – and analyzing and controlling these differences are fundamental to product quality. What factors can influence heat flux? Heat flux and heat flux profiles are determined by air velocity and oven temperature.2 Airflow plays a big role in the amount of convective heat flux experienced by the product. The emissivity of the radiating object (oven ceiling) and the temperature difference between the hot object and the cold object (product), play a big role in the amount of radiant heat flux experienced by the product. How is heat flux measured? Oven Heat flux profiles are often used when trying to produce the same product on two different lines, or when trying to transfer product from one line to another. When the heat flux component profiles are matched, the two lines will produce the same product. The ratio of heat flux components is an important factor for baked product quality. Even if the same amount of heat flux is delivered to a given product, the convective heat transfer may vary. 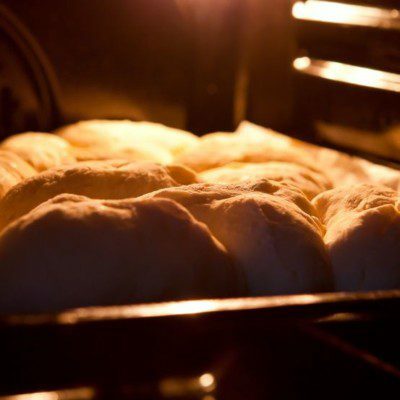 The variation could affect energy consumption as well as the appearance and quality of the baked product. For cake baking, cake volume expansion will be reduced significantly when the convection fraction in heat flux is reduced.3 This is because the crust will form faster due to the higher radiation mode of heat transfer, thus preventing volume expansion development. Zareifard, M.R., et al. “A Method For Balancing Heat Fluxes Validated For A Newly Designed Pilot Plant Oven.” Journal of Food Engineering, vol. 76, no. 3, 2006, pp. 303–312. Fahloul, D., et al. “Measurements and Predictive Modelling Of Heat Fluxes In Continuous Baking Ovens.” Journal of Food Engineering, vol. 26, 1995, pp 469–479. Zareifard, M.R., et al. “Bakery Product Characteristics As Influenced By Convection Heat Flux.” Food Research International, vol. 42, 2009, pp. 856–864. Enter your information below to receive your free eBook download: Reading Thermal: Measure Your Heat Flux . BAKERpedia and Reading Thermal will use this information to be in touch with you and to provide updates and marketing. Required fields are marked with a red asterisk (*).